I've been wanting to get a fatter kick drum sound for a while and looking into options. 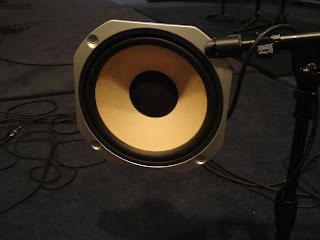 We've used an Audix D6 on the kick for a few years and it is a great all-around kick mic but I'm intrigued by the double-mic technique that a lot of people are using - one mic is geared towards capturing the attack of the kick while another mic is used to accent the thump. 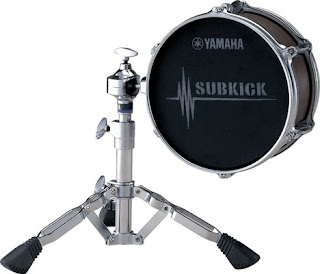 I've seen many bands use a Yamaha Subkick with great results. At $400 it's a little out of my price range so I decided to improvise. The Yamaha Subkick is basically a 6.5 inch speaker wired to an XLR cable with a nice enclosure and stand. I did a little research online and found out that it's pretty easy to make one yourself - maybe even with materials you already have laying around. I had an old set of JVC speakers in my basement that weren't used very often. The low frequency speaker in them is 7.5 inches - a little larger than the Yamaha but it seems to work fine. I also had an extra mic cable that I cut off about 4 feet from the end with the male connector. Before making final connections I tried a few different options and found that it sounded best when I wired Pin 2 to the positive connector and Pin 3 to the negative connector. 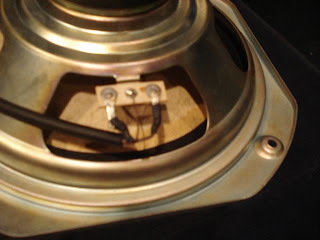 I wired Pin 1 to the ground spot on the speaker. I used a short boom stand to mount the speaker. I took the screw out of a standard mic clip and ran zip ties through the holes in the clip and speaker to secure it. I place the subkick a few inches off the resonant head on the opposite side of the sound hole. This mic is really hot! If you have an inline pad, I recommend using it. I have the pad turned on with my console and I still don't use any gain for the subkick. I adjusted the EQ to really bring out the "feel it in your chest" bass from the kick drum. I used no high pass filter, boosted 90 hz and cut 400 hz. 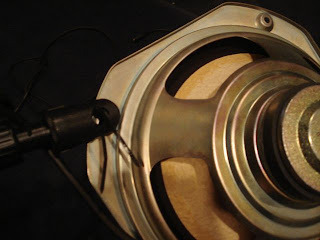 I still use the Audix D6 inside the drum about 2/3 inside the soundhole pointed at the beater. I put a high pass filter on it and swept the low mid and high mid frequencies until I found a spot that accented the attack nicely. Boosting 5.5k and cutting 400hz seems to do the trick. I usually bring the Audix D6 up until I like the amount of attack I'm getting. Then I bring the subkick up to a level that complements the attack sound. I've really been pleased with the results! 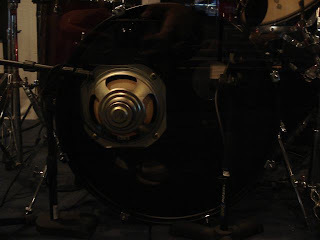 Thanks to Wade's blog for the info, pics and sound samples! Thanks also to Trevor H. for all the soldering help! Great post, bro. I might be putting this into use in the near future. The change in sound quality is noticeable and this is a great alternative to spending the dough. Good stuff.